Lock in a great price for Radisson Collection Hotel, Warsaw – rated 8.3 by recent guests! The hotel is very clean. We really enjoyed the spa facilities; the water temperature of the swimming pool and the jacuzzi was just perfect. The staff was really helpful with a few of our requests. Breakfast was delicious and I kolęd the way it was served. Location, OK. The fitness club is nice, but it is a separate from the hotel, but in the same location. Room clean and quiet. We had 8 floor. What you would expect from a business hotel. Nothing less, but also nothing more. Staff at reception could have been a bit more smiling and efficient. It was a nice, friendly hotel with good service. The rooms were spacious and staff was very helpful. Excellent hotel! Exceptional staff! Great location! breakfast was excellent and the room, the pillows, the blanket and the bed. Staff at reception were efficient but not very welcoming or warm. Room was a "sub suite" - which is in most cases not the best. No bathtub, for instance. I was disappointed, but did not make a fuss for one night. Breakfast was OK, but not brilliant. Location is good. The bed was comfortable and there was CNN world news on TV. Radisson Collection Hotel, Warsaw This rating is a reflection of how the property compares to the industry standard when it comes to price, facilities and services available. It's based on a self-evaluation by the property. Use this rating to help choose your stay! One of our top picks in Warsaw.Offering free WiFi and a wellness center with an indoor pool, Radisson Collection Hotel, Warsaw is just a 10-minute walk from Warsaw Central Station. Air conditioned rooms with tea and coffee facilities are available. The spacious and modern rooms at the Radisson come with a mini-bar, a safety deposit box and a large work desk. All have a large, modern bathroom with a hairdryer. During their stay, guests can relax in a wellness center, which offers a sauna, a spa pool, a gym and a massage parlor. Front desk staff is available 24 hours a day. Radisson Collection Hotel, Warsaw houses the Ogrodowa Restaurant, where breakfast buffet is served, and @Ferdy’s Restaurant, offering Polish and international cuisine. The Lobby Bar serves coffee, cakes and classic Polish starters. The hotel is located just a 10-minute walk from Złote Tarasy Shopping Center and the Palace of Culture & Science. Warsaw Chopin Airport is just a 20-minute drive away. 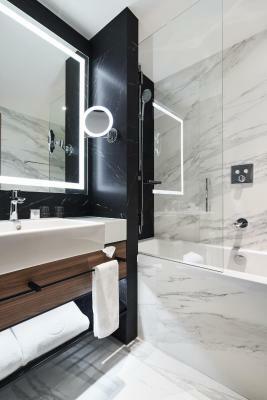 When would you like to stay at Radisson Collection Hotel, Warsaw? Featuring a separate living room, rain shower and coffee and tea making facilities, the suite is equipped with free Wi-Fi. Guests can enjoy one complimentary garment pressing per stay and are provided with bathrobe and slippers. A morning newspaper is delivered to the room. Upon request, the room can be prepared for bedtime in the evening. Private parking is available on site (reservation is not needed) and costs PLN 12 per hour. Private parking is available on site (reservation is not needed) and costs PLN 140 per day. This room features a sofa and rollaway bed. 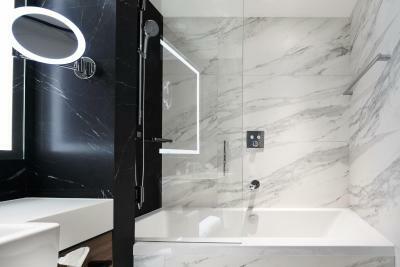 Additionally it has a walk-in rain shower, a separate bathtub and a Nespresso machine. Guests can enjoy one free garment pressing per stay and pillow menu. Additionally guests can enter the 2-level gym, saunas, hot tub and pool free of charge. The suite is equipped with an espresso machine and tea making facilities. A complimentary water is provided as well as free WiFi and pillow menu. Guests can make use of one free garment pressing per stay. Room located on the upper floors featuring a city view. A complimentary bottle of water is provided and free WiFi. The guests can order from the pillow menu and are provided with a bathrobe. This room includes free WiFi, a laptop-size safe, mini-bar, one free garment pressing per stay, coffee and tea making provisions and pillow menu. This room features an espresso machine and tea making facilities, free WiFi, bottle of water and pillow menu in the Collection Premium Rooms. A bathrobe is provided for the guests. Upon request, the room can be prepared for bedtime in the evening. This room features city views. In this room a complimentary bottle of water is provided and free high-speed WiFi. Room includes amenities such as fully stocked mini-bar, bathrobe and slippers. 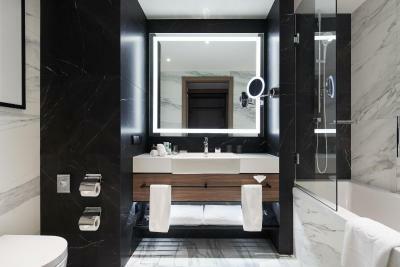 House Rules Radisson Collection Hotel, Warsaw takes special requests – add in the next step! One additional older child or adult is charged PLN 130 per person per night in an extra bed. Radisson Collection Hotel, Warsaw accepts these cards and reserves the right to temporarily hold an amount prior to arrival. Please note that guests who are booking on behalf of someone else must contact the hotel prior to arrival in order to arrange for third party billing. Hotel reserves the right to send an online payment link for all booked nights. Please note that different working hours for wellness zone apply during Christmas; New Year, Easter Holidays Friday-Monday, Corpus Christi and public holidays in Poland: Jan 6, May 1, May 3, Aug 15, Nov 1, Nov 11. Initial response at the reception was poor and the room they offered was dirty with damaged furniture. Accepted my complaint and changed the room which was much cleaner with new outfittings. The hotel is old and tired looking. Needs an upgrade asap. The Spa area is outdated and feels old and uninviting. The pool area is always too full with people. The hotel is looked after and is clean and well organized. Breakfast is very good. The gym is very equipped. Service was slow, reception staff and hotel response to contact was slow. The bar was lovely and the bar staff were great, but service was slow. Very good breakfast with rich options and custom made scrambled eggs or omelets. We had very nice room on 8th floor with great view on PKiN. My wife had to leave the room at 6:00am, to early for breakfast but there was coffee and something to eat available for such occasion. My husband was happy that we were offered a smoking room. Very comfortable room, efficient staff and close to the shopping areas and old town. Room was for 3 but there was no third bed. Even by asking we did not get the third bed. The service was really unfriendly. When we asked about the third bed we got really rude answers and one of us had to sleep on a very small couch. Perfect room and service, very clean. It is a high quality hotel. Wellness is amasing in the hotel. It is located in the centre of Warsaw. The breakfast was not spectacular and noisy. We order roomservice, the hamburger was delicious but the pizza was not high quality. pitty for a hotel like this. We got a very fast check-in and the staff was very friendly, the rooms have a comfortable bed with a nice bathroom. Also we have a small dog with us and this was not any problem. Very weak WiFi signal in the room, absolutely unusable. Unreasonably high prices for mini bar (aluminum can of Coca Cola for 5$). The breakfast is ok, but the voice is poor. Room was too hot even if I adjusted temperature minimum. We had to keep window open to cool down room but then it was noisy during night. Breakfast was good and location is very nice. Nothing to dislike But if I was picky, the quality of the towels left a lot to be desired.